A classy, feisty center man. Nick was a product of the Niagara Falls Minor Hockey Program. 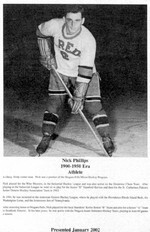 Nick played for the Wire Weavers, in the Industrial Hockey league and was also active on the Dominion Chain Team. After playing in the Industrial league he went on to play for the Junior "B" Stamford Kerrios and then for the St. Catharines Falcons Junior Ontario Hockey Association Team in 1943. In 1944, he was recruited to the American Eastern Hockey league, where he played with the Providence Rhode Island Reds, the Washington Lions, and the Johnstown Jets of Pennsylvania. After returning home to Niagara Falls, Nick played for the local Stamford Kerrio Senior "B" Team and also for a Senior "A" Team in Stratford, Ontario. 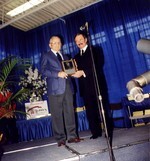 In his later years, he was active with the Niagara South Oldtimers Hockey Team, playing at least 60 games a season.